Christian Friedrich Schwartz was born in Prussia (i.e., contemporary Poland) in 1726. 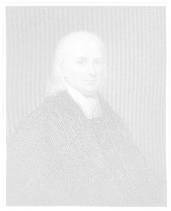 Ordained in Copenhagen in 1749, he arrived in India in 1750 as a Lutheran missionary. He worked in Tranquebar, Trichinopoly, and Tanjore, India, for forty-eight consecutive years without returning to his native Prussia. While in India, Schwartz learned Tamil, Telugu, Sanskrit, Persian, Hindustani, Marathi, and Portuguese, and he assisted in the translation of the Bible into Tamil. 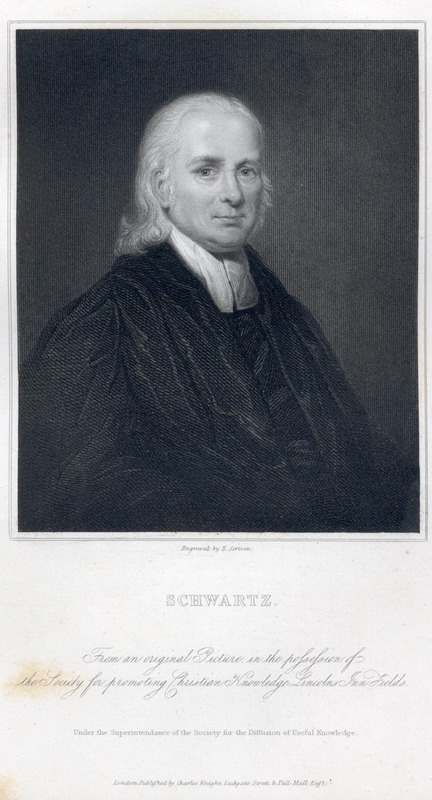 Not the first Lutheran missionary to India, Schwartz benefited from the work of numerous missionaries including two eminent German predecessors: Bartholomäus Ziegenbalg (1683-1719) and Heinrich Plütschau (1678-1747). Both of these missionaries came from the Pietist tradition at the University of Halle, where Schwartz had studied theology, Hebrew, Greek, Latin, and various European languages. 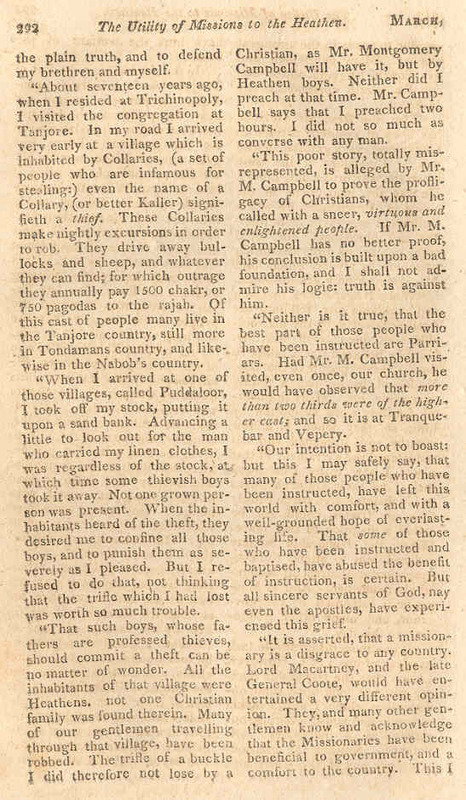 Acknowledging his own awareness of and debt to Ziegenbalg's example, William Carey said, "In 1706, the king of Denmark sent a Mr. Ziegenbalg, and some others to Tranquebar, on the Coromandel coast in the East-Indies, who were useful to the natives, so that many of the heathens were turned to the Lord" (An Enquiry into the Obligations of Christians to Use Means for the Conversion of the Heathens, p. 36). Schwartz's indirect influence on Carey occurred through the administrative protection of Carey by Colonel Bie, the Danish governor of Serampore. Prior to Carey's arrival in India, Bie had been a disciple of Schwartz. 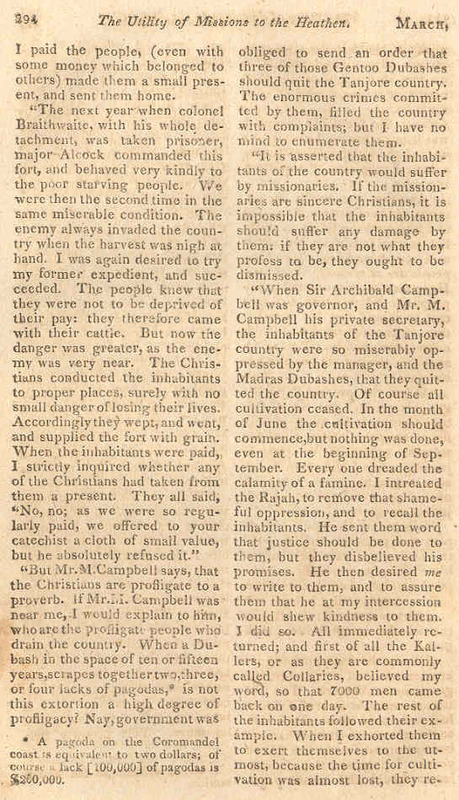 When Schwartz arrived in south India, the Tamil-speaking Christian community established by Ziegenbalg and others exceeded seventeen hundred persons. Originally sponsored by the Danish Missionary Society in Copenhagen, Schwartz landed in 1750 at the Danish settlement of Tranquebar on the Coromandel (i.e., southeast) coast of India (Tranquebar is known now as Tarangambädi in the Tamil Nadu area of India). 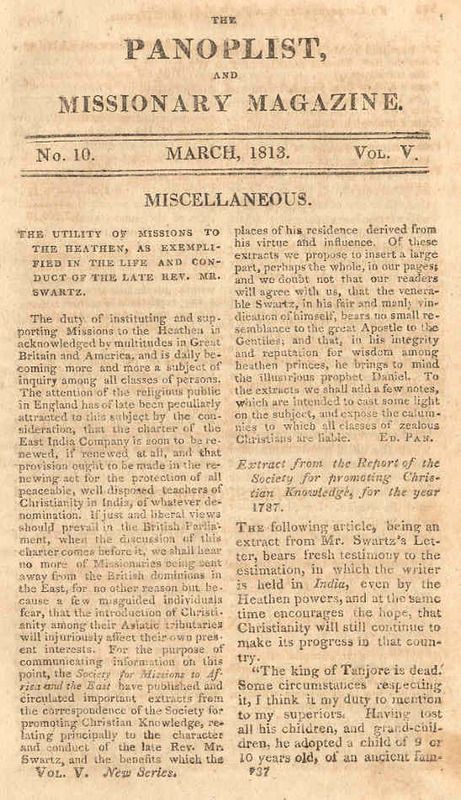 He later served as a chaplain-missionary to the British community in India, and beginning in 1767, he was sponsored by the Anglican Society for the Promoting Christian Knowledge, London. In 1768, the East India Company appointed Schwartz as a chaplain in Trichonopoly. 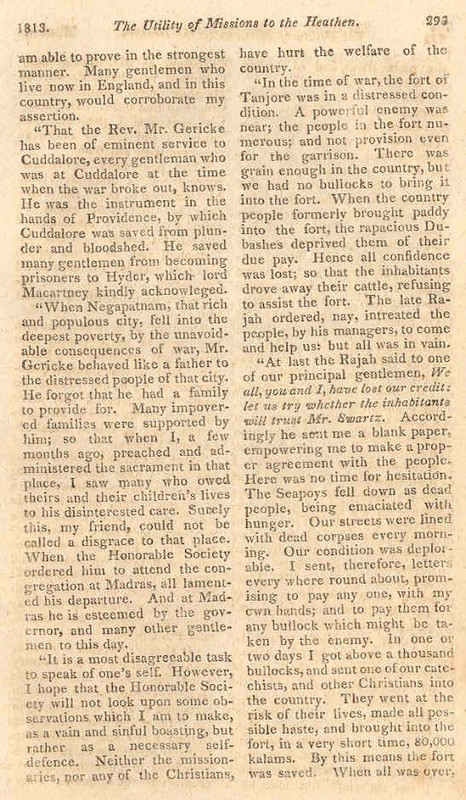 Ten years later in 1778, Schwartz moved to Tanjore where he lived the rest of his life. During his service with the British, Schwartz was known as a peacemaker (i.e., diplomat) during times of war caused by the East India Company's aggressive policies in India. Schwartz's linguistic abilities became legendary as he related easily among Germans, English, Portuguese, and many different Indian peoples. He endeared himself to the Indians as he established many schools for native Indians and orphaned Indian children. At his death in 1798, the East India Company erected a monument honoring Schwartz in St. Mary's Church, Madras. 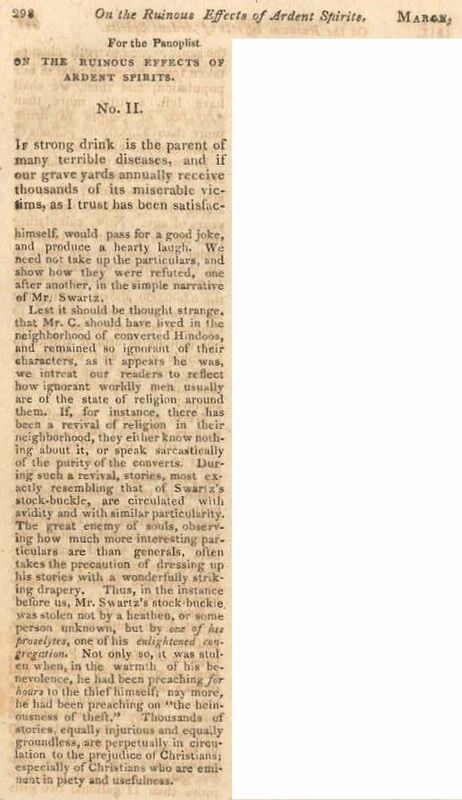 Of particular interest is the story of Schwartz's relation to Tulaji Rajah of Tanjore, whom Schwartz befriended. When Tulaji Rajah died, Schwartz became the raju-guru (i.e., protector and regent) for Serfoji, Tulaji Rajah's adopted son. 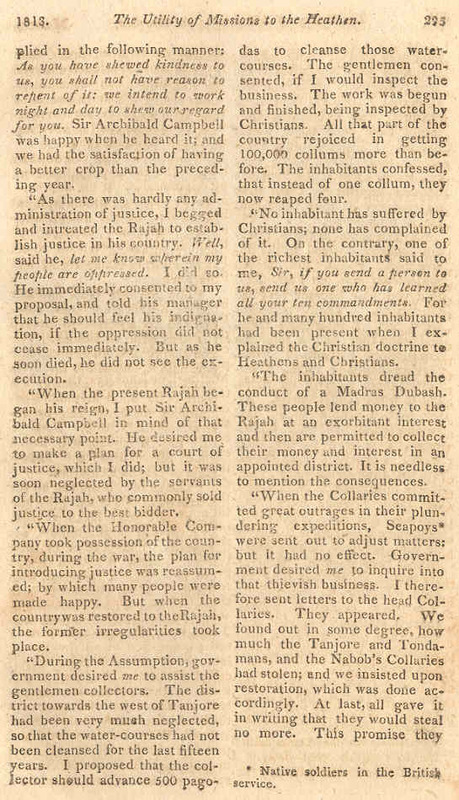 In 1787, the Madras authorities recognized Serfoji Maharaj, the ruling king of Tanjore, 1798-1832. 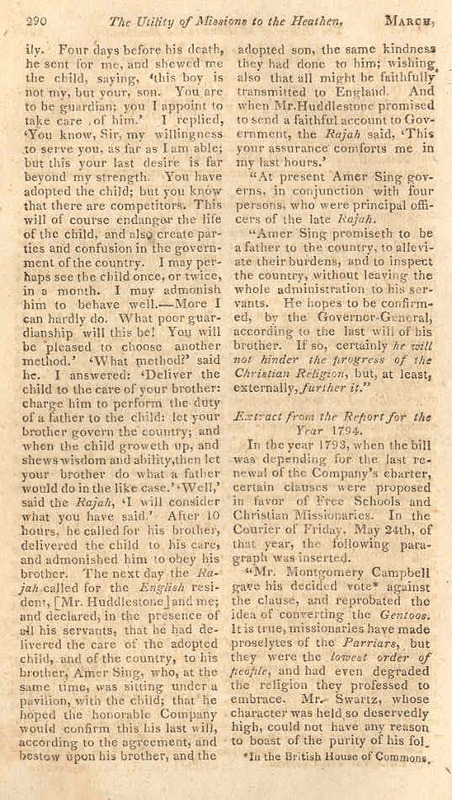 As Serfoji grew, he came to view Schwartz as a father figure, and at Schwartz's death in 1798, Serfoji received Schwartz's final blessing for equitable rule, protection of Tamil Christians, and peace from God. 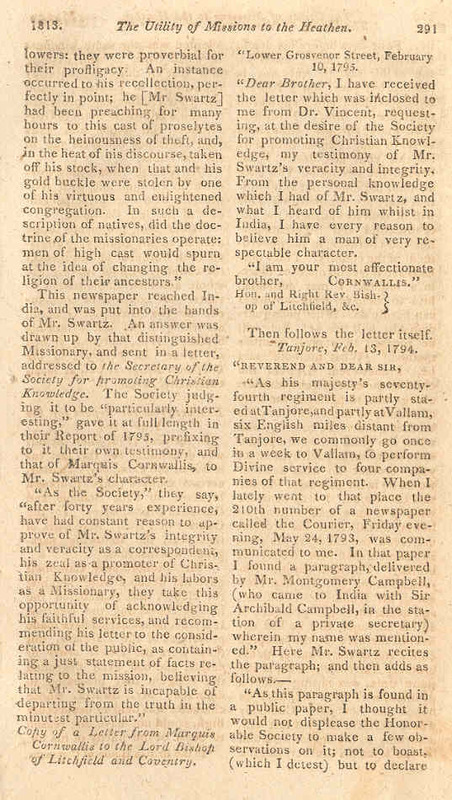 At Schwartz's memorial service, Serfoji composed and read a eulogy in English; he also had a monument to Schwartz erected in Christ Church, Tanjore. Schwartz won the admiration of Hindus, Muslims, and European settlers in India. 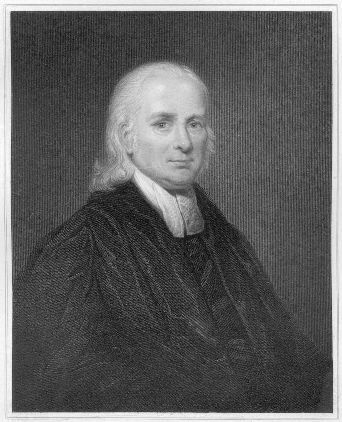 In Britain, one historian of missions later referred to Schwartz as the apostle to South India after which Carey became the apostle to North India. Though estimates vary, by the time of his death, Schwartz was effective in gaining over six thousand Indian converts--both Hindus and Muslims--to Christianity. 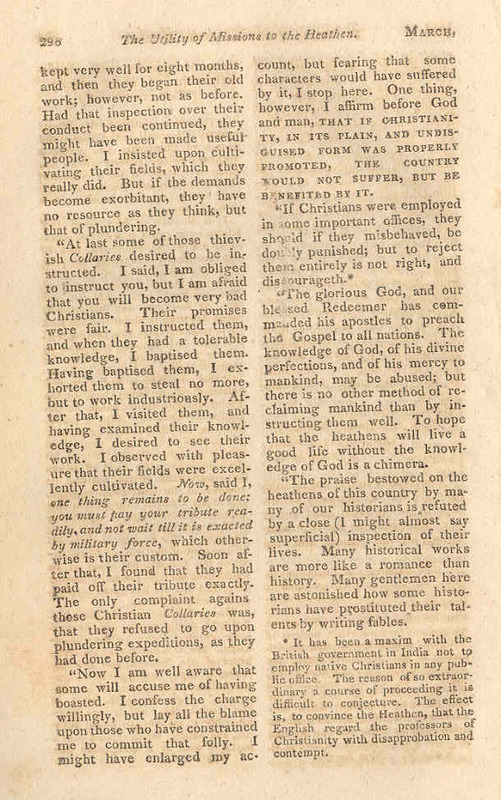 Following below is an extract of Schwartz's 1787 supporting essay on Christian missions to the heathen. 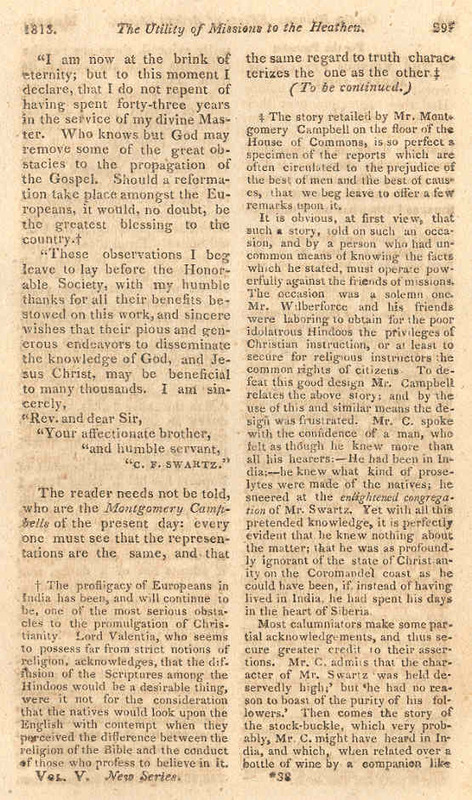 His essay originally appeared in "Report of the Society for Promoting Christian Knowledge, for the Year 1787," but is presented here from The Panoplist and Missionary Magazine published in Boston, Massachusetts. of the Late Rev. Mr. Swartz"